This book is a detailed and informative record of the development of the aircraft carrier, from its pioneering years to the nuclear-powered super carriers of the future. 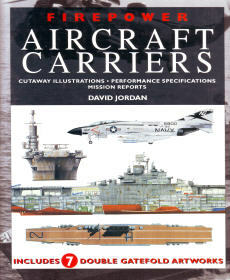 Lavishly illustrated with full-color artworks and archive color and black-and-white photographs, each ship is accompanied by full specifications listing displacement, dimensions, speed, aircraft complement, armament, and electronics, while seven gatefold illustrations reveal further detail in unique cutaway plans of these spectacular and powerful weapons of war. 274 pgs w/index, HB w/dust jacket, 6.25 x 9.25, b&w photographs.